As many as 1,756 families in Gyumri celebrated their moving to new apartments on Monday nearly a quarter of a century after losing their homes in a devastating earthquake. “Today is a holiday for us, a joyous occasion... we have waited for this holiday for 24 long and hard years, we have raised generations in makeshift housing, our children studying in tents. Today is a historic day for us,” said Gyumri’s newly elected mayor Samvel Balasanyan at the ceremony. A total of 38 four-storied multi-apartment buildings (taller buildings are not allowed to be built in Gyumri) were put into use in Gyumri in what was the latest commission of new housing in the second largest city of Armenia that suffered huge destruction and human loss in the 1988 earthquake. President Serzh Sargsyan also participated in the ceremony as he visited the city’s Mush-2 and Ani districts to inspect the progress of the second phase of a state program aimed at providing housing to earthquake survivor families now living in makeshift housing conditions. The realization of the program was one of the election pledges by Sargsyan, who is likely to vie for a second five-year term as president in next year’s presidential election. A total of 85 billion drams (about $209.8 million) have been spent as part of the program launched in 2008. Since 2010, 2,812 of officially registered 4,270 homeless families in Gyumri have received housing of their own as part of the activities. It means that 1,458 families are still on the waiting list for new apartments. Some families have been taken off the list as they had already received apartments before. According to official information, 743 apartments are now being constructed, while there are also immediate plans to launch the construction of another 608 apartments. As a result, an additional 1,351 families will move into new homes soon. Authorities promise the new buildings will be put into operation by the end of 2013. After the completion of the current program, however, Gyumri won’t get rid of its ugly and already rusty iron “domiks” slums where more than 3,000 families continue to live today. A majority of these families got into those makeshift huts not because of the earthquake. Many of them had already got new housing from the state, but had to sell it for different reasons. Therefore, the government is not responsible for providing housing to them. Chairman of Gyumri’s Shirak Center NGO Vahan Tumasyan says that the most recently commissioned apartments are better than those put into operation in 2010. 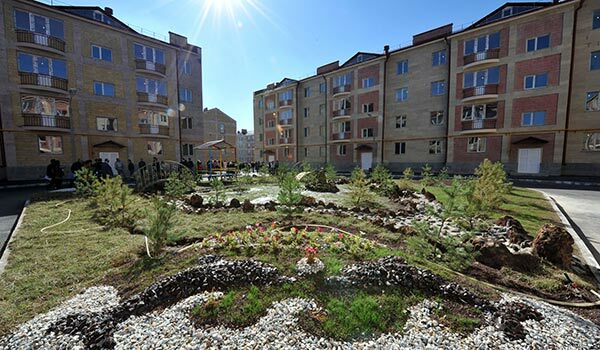 The Shirak Center said it had followed the construction work to ensure its quality as well as the lottery made for the distribution of apartments, which was broadcast live on the NGO’s website and then the video was put on their YouTube channel. Tumasyan said Shirak Center employees had also checked the documents of the beneficiaries to expose any possible fraud. “I can say that these are solid buildings, they have a nice interior design. Of course, they could have done in a better way, but considering the amount of funding, they did a good job. As for the school built in the district, there is probably not such a school anywhere else in Armenia. It is very bright, with beautiful halls, classrooms,” Tumasyan told ArmeniaNow. The newly constructed buildings were put into operation with all proper infrastructure such as water supply, drainage, gas supply, electricity, asphalted roads and street lighting systems. The Glendale Hills company, which has carried out the construction, left many dissatisfied with its previous work. Even cases of ceiling plaster collapsing were registered. Now the company has pledged to redress any possible shortcomings connected with the interior design within a year, while removing all possible drawbacks connected with the exterior of the buildings within four to five years. On his latest visit to Gyumri President Sargsyan avoided assessing the quality of the buildings, saying that when the apartments are supplied with all necessary equipment he will visit again and give his evaluation.